Knowing the limitations of string inverters may tell you just why the Module Level Power Electronics segment – including Blue Frog/APsystems microinverters – is on the rise. Not made in the shade. By offering independent, module-level inversion, a Blue Frog/APsystems microinverter installation can outperform a conventional string array by up 20 percent. You’ll get the most out of every module, every hour of the day. Want to add modules? Too bad. Blue Frog/APsystems microinverters are the forward-thinking choice, letting you add on to your array at any time, easily and cost effectively. Better value in the long run. Thanks to module-level inversion at these lower light levels, Blue Frog/APsystems microinverters enjoy a superior output and higher rate of energy production. Blue Frog/APsystems microinverters take the jolts out of the volts. Module-level inversion means only low-voltage DC in each circuit, keeping you safe over the life of the system. Module-level power is the future. String inverters still have their niche, but module-level power inversion is tomorrow’s technology today. A leading analytics firm recently noted that sales of microinverters and related products should top 2 gigwatts by year’s end, and predicts microinverters’ share of the larger MLPE market could triple by 2018. That’s a product with a bright future. That’s a product with a bright future. It’s been a blue-ribbon year at Blue Frog Solar. It’s all thanks to you, our installers, for selecting Blue Frog/APsystems microinverters for your residential and commercial solar projects. 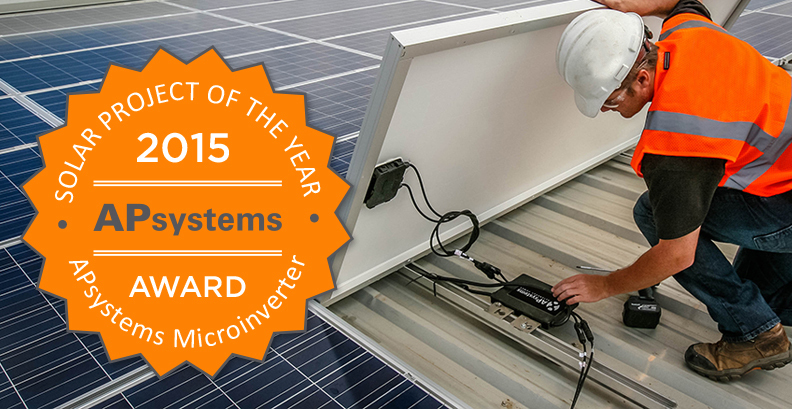 You’ve made our certified Made In Washington microinverters the inverter of choice across the Northwest solar market. Our YC500-MIW is powering homes and businesses throughout the region, a key component of our massive shift toward clean, renewable energy. Microinverter technology has found the sweet spot for power, reliability and low cost that solar installers and their customers are looking for. How popular are they? A leading analytics firm recently noted that Module Level Power Electronics shipments including microinverters and related products could hit 1.5 gigawatts by year’s end in the U.S. alone. The MLPE segment could see five-fold growth by 2017, topping 5 gigawatts shipped. Microinverters are here to stay. And Blue Frog Solar will be here for you. As 2015 winds down, it’s time once again to look back on the great solar successes of the past year and share our very best stories with the industry and the world. Blue Frog Solar’s manufacturing partner APsystems is pleased to announce its second annual Solar Project of the Year Awards. Tell them about your very best project – what set it apart in terms of scale, design, power output, challenging conditions, or your creative application of Blue Frog/APsystems microinverter technology. Include a brief write-up about your best installation, or more – enter all the projects you like. Top projects in both Residential and Commercial categories will be honored. The winner in each category will receive at $500 gift card! Submit your project entries here by January 8th 2016. The APsystems new Fall Rebate is here, offering big year-end savings to you for purchasing the YC500 microinverter through Blue Frog Solar. How big? Try $700 back from APsystems on your first three installations using the Blue Frog/APsystems YC500 MIW dual-module microinverters, now through Dec. 31, 2015. That’s right: You’ll get $100 back on your first two installations completed and registered* during the rebate period, and $500 back on the third – tremendous savings for you. This is the best opportunity yet to bring Blue Frog/APsystems microinverters to your solar customers. Call Blue Frog Solar today to take advantage on this dynamic year-end promotion. Full terms and conditions of the APsystems Fall Rebate program are available here or email aplus [at] APsystems [dot] com. Again, the APsystems A+ Rewards Fall Rebate period runs Oct. 1 through Dec. 31 2015. Place your order with a participating distributor today for prompt fulfillment. *System registration requires an APsystems ECU gateway. Global solar technology leader and Blue Frog Solar partner APS is now APsystems. The brand refinement highlights the company’s commitment to powerful alternative energy solutions, and its evolution from a product-oriented portfolio to a whole-systems innovator. The phrase “Altenergy Power,” a nod to the company’s original legal name, will appear beneath APsystems in the company’s new mark. Blue Frog Solar manufactures and distributes the APsystems YC500 microinverter under license. Now get $15 back for EVERY Blue Frog YC500 microinverter. Blue Frog and APS have updated our unprecedented offer to make it even easier for installers to try APS and put in their pocket. Now until September 30th, installers can earn $15 back for every Blue Frog/APS YC500 microinverter purchased through Blue Frog Solar. Installers can receive a VISA® Gift Card with $15 value added for every Blue Frog/APS microinverter purchased. That’s $210 back in your pocket for an average residential installation with 14 APS YC500 dual-module microinverters (other models not eligible). Do you complete five jobs a week? That’s more than $1,000 back to your bottom line – easy money for choosing Blue Frog/APS microinverters. First time Blue Frog installers can get even more – including a free APS Energy Communication Unit. 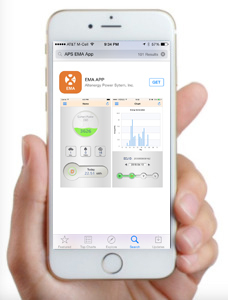 The APS Energy Monitoring and Analysis App is now available for iPhone and iPad. The EMA App allows APS microinverter system owners to track solar array performance in real time through their iOS mobile device. The APS EMA App is available for iOS devices through the Apple iTunes App Store. The app requires iOS 7.0 or later required and offers English and simplified Chinese language support. Click here to download the EMA App user manual. Summertime means lots of solar being installed, and with the A+ Rewards summer incentive programs, there’s no better time to purchase Blue Frog/APS microinverters. 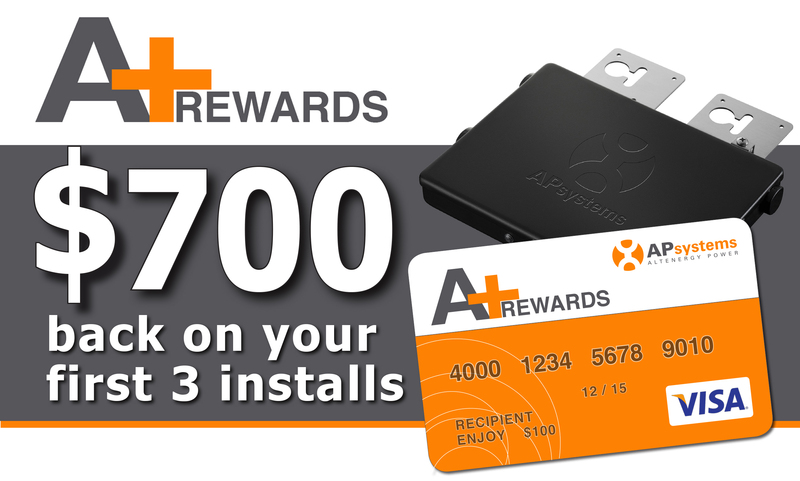 Plus, APS America is now offering a huge bonus incentive for first-time installers. With the new Tiered Rewards Program, the more Blue Frog/APS microinverters you buy through Sept. 30, 2015, the bigger your rebate – up to $15 back per unit. That’s right: Every APS YC500 microinverter you purchase from us through Sept. 30, 2015, will earn you up to $15 back from APS. Show proof of purchase through the rebate website http://summer-promo.aplus-rewards.com, and APS will send you a Visa® Gift Card with value added for every microinverter purchased during that period. The rebates are tiered, and the number of units you purchase adds up over the course of the promotion, so as you order more, your rebate level increases. For example, the rebate amount for a 500-unit total would be $6,000 (calculated as 50 @ $5, plus 100 @ $10, plus 250 @ $13, plus 100 @ $15). That’s tremendous savings you won’t find anywhere else in the industry – our reward to you for being a Blue Frog/APS partner installer. Are you a first-time Blue Frog/APS installer? It gets even better. First-time Blue Frog/APS installers who order microinverters through Blue Frog Solar will receive even more: a $250 Visa® Gift Card, and a free ECU (Energy Communication Unit) – with free monitoring for the life of the product. Plus the tiered rebate on top of that. With $250 back and a free ECU with free monitoring, power your solar summer with Blue Frog/APS microinverters and find out why APS is the fastest-growing solar microinverter provider in the world. Full terms and conditions of the rebate program are available at http://summer-promo.aplus-rewards.com, or email aplus [at] apsamerica [dot] com. There’s never been a better time to bring Blue Frog/APS microinverters to your customers, and we’re glad to partner with APS for this incredible promotion. 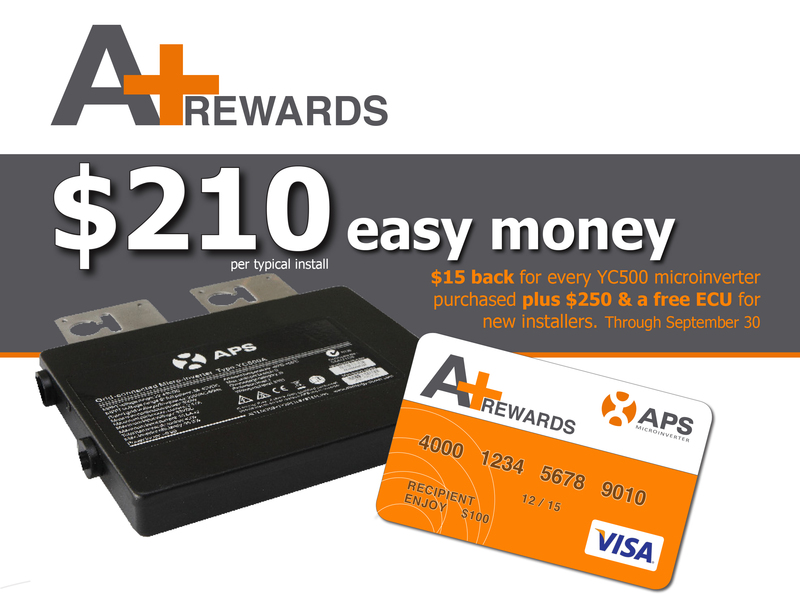 Remember: The new APS A+ Rewards Tiered Rebate & First Time Installer Programs run July 1 through Sept. 30, 2015. Place your order with Blue Frog Solar today for prompt fulfillment. Blue Frog Solar is proud to be partnering with Habitat for Humanity of Kitsap County on the Harris Court self-help housing project in Port Orchard. 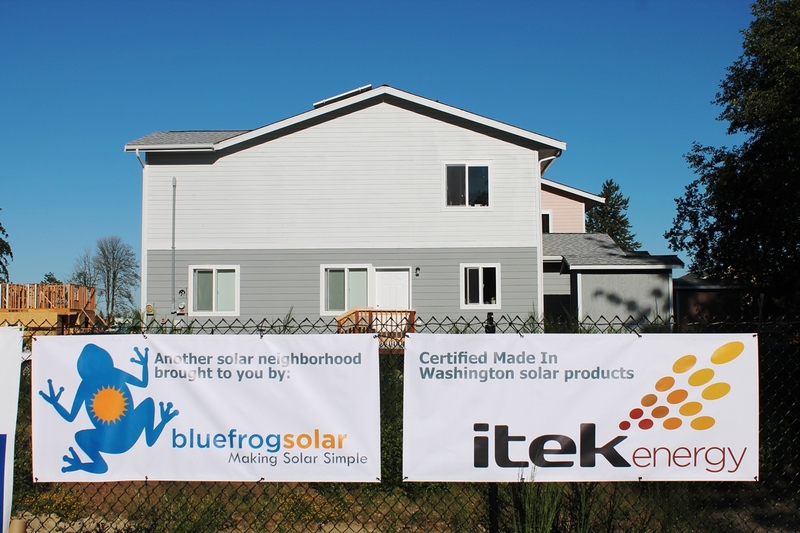 With contributions by Blue Frog and itek Energy, each family in this attractive and affordable new neighborhood will enjoy the benefits of their own PV system. 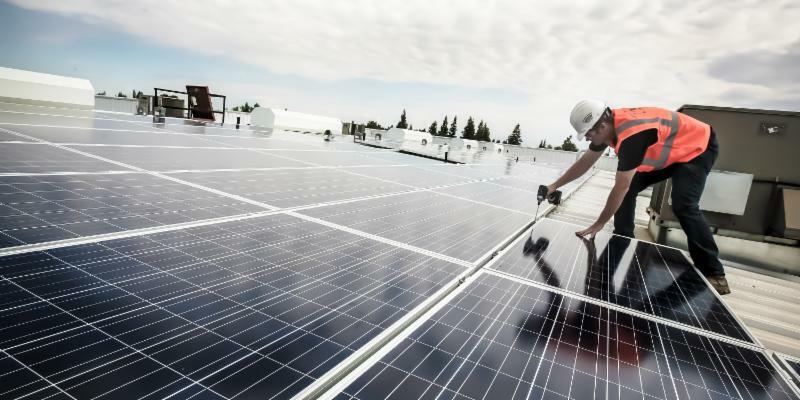 Thirty-two single-family homes are planned, with buildout over the next several years — all powered by Made In Washington solar equipment. Find out more about the Harris Court project at the Kitsap Habitat website, and also on our Blue Frog Featured Installations page. Thanks to Habitat for Humanity of Kitsap County for inviting us to put up banners at the job site, to celebrate our partnership and spread the word about Washington solar. And way to go, new homeowners! Good news, installers: The A+ Rewards program has proved so popular, we’re extending the rebate period through the end of June. That gives you an extra month to earn cash back for purchasing Blue Frog/APS microinverters. That’s right – every YC500 microinverter you purchase from Blue Frog through June 30, 2015, will earn you $10 back from APS. Show proof of purchase through the rebate website, and APS will send you a Visa® Gift Card with $10 value added for every microinverter purchased during that period. Full terms and conditions of the rebate program are available at www.aplus-rewards.com, or email aplus [at] apsamerica [dot] com. This is a great opportunity to bring Blue Frog microinverters to your customers, and we’re glad to partner with APS for this extended promotion. Again, the APS A+ Rewards rebate period now runs through June 30, 2015, for your company. Place your order with Blue Frog today for prompt fulfillment.